Includes one plate of the specified size. Choose from 2.5, 5, 10, 25, 35, 45 lb. The steel composite casting of this unique rubber coated weight plate is much stronger than cast iron plates. The wide hub design makes it easy to load on a bar without finger pinch, and it's also easy to pick up off the ground. 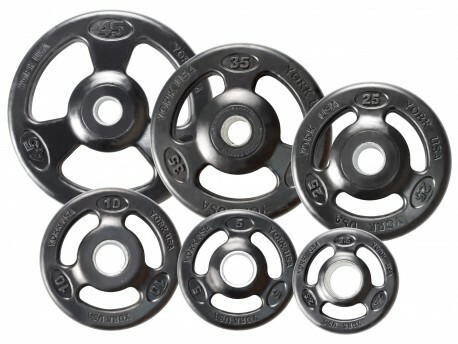 These plates, and all of York's current models of plates, have slightly larger holes than "snug" plates, making for a relatively loose fit on bars made with strict 50mm (1.97") diameter sleeves. Diameter of 45lb Plate 432mm / 17"